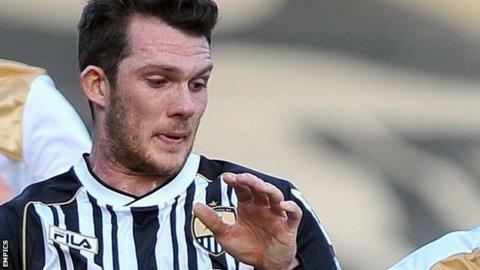 Notts County moved to within a point of League One safety as Jimmy Spencer's header secured a win over Crawley Town. Notts recovered from an edgy start and Ronan Murray went close before Spencer grabbed his fourth goal in four when he headed home Alan Sheehan's free-kick. Crawley were on top after the break and home goalkeeper Bartosz Bialkowski made fantastic saves from Matt Tubbs, Gary Dicker and Gwion Williams. But Notts held on and are only a point behind Crewe, Tranmere and Colchester. Crewe and Colchester played out a 0-0 draw while Tranmere drew 0-0 with Sheffield United. "Dropping the 3 points on Friday was a hard pill to swallow. "We knew this one was important - a must win because we have always said it will be the home results that determine where we are going to finish. "You don't expect any favours and they made it hard for us. They caused us many problems, but with a little bit of luck we've managed to come out victorious." "We seem to have a problem against teams in the lower half and I think it is a mental problem and it will need to be a lot better next season. "We cannot afford to play against lower half teams and not perform. "I think had the players gone about playing against teams in the lower half as well as they play against the teams in the top half Richie Barker would still be here. "I've got to review contracts this week and look at everybody for next season. "The harsh reality is that we need to build for next season and that's what we have done in the last few games and that's what I've done. "I have to look at everybody and think, who do I want to go to war with and whose going to roll their sleeves up and wear the shirt with pride?" Match ends, Notts County 1, Crawley Town 0. Second Half ends, Notts County 1, Crawley Town 0. Attempt saved. Jamie Proctor (Crawley Town) header from the centre of the box is saved in the centre of the goal. Corner, Notts County. Conceded by Kyle McFadzean. Attempt blocked. Dannie Bulman (Crawley Town) right footed shot from outside the box is blocked. Corner, Notts County. Conceded by Mark Connolly. Hand ball by Gary Liddle (Notts County). Substitution, Crawley Town. Dannie Bulman replaces Gary Dicker. Substitution, Crawley Town. Jeffrey Monakana replaces Sergio Torres. Corner, Notts County. Conceded by Sergio Torres. Substitution, Notts County. Mustapha Dumbuya replaces Callum McGregor. Attempt saved. Ronan Murray (Notts County) right footed shot from outside the box is saved in the top centre of the goal. Corner, Crawley Town. Conceded by Bartosz Bialkowski. Attempt saved. Gary Dicker (Crawley Town) header from the centre of the box is saved in the top centre of the goal. Attempt missed. Jamie Proctor (Crawley Town) header from the centre of the box is close, but misses to the right. Corner, Crawley Town. Conceded by Jamal Campbell-Ryce. Attempt saved. Matt Tubbs (Crawley Town) right footed shot from the centre of the box is saved in the bottom right corner. Attempt blocked. Jamie Proctor (Crawley Town) left footed shot from the centre of the box is blocked. Attempt saved. James Spencer (Notts County) right footed shot from outside the box is saved in the top centre of the goal. Attempt blocked. Matt Tubbs (Crawley Town) right footed shot from the centre of the box is blocked. Attempt saved. Michael Jones (Crawley Town) right footed shot from the centre of the box is saved in the centre of the goal. Corner, Crawley Town. Conceded by Ronan Murray. Corner, Crawley Town. Conceded by Hayden Mullins.